Rush Medical College opened a new building at Dearborn Street and Grand Avenue in 1867 to accommodate its growing student population, only to see it destroyed in the Great Chicago Fire. 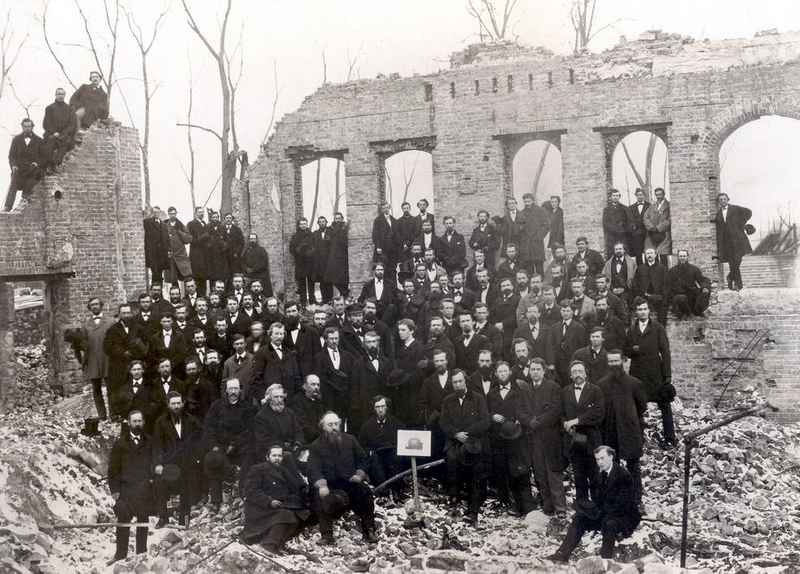 Faculty members and students stand amid the ruins in this 1871 photo. Hoping to avoid another disastrous fire, Rush Medical College moved in 1875 to the corner of Wood and Harrison streets, on the edge of what’s now the Rush University Medical Center campus. View more historic photos from the Rush Archives. This entry was posted in Rush Archives, Rush University and tagged Great Chicago Fire. Bookmark the permalink.